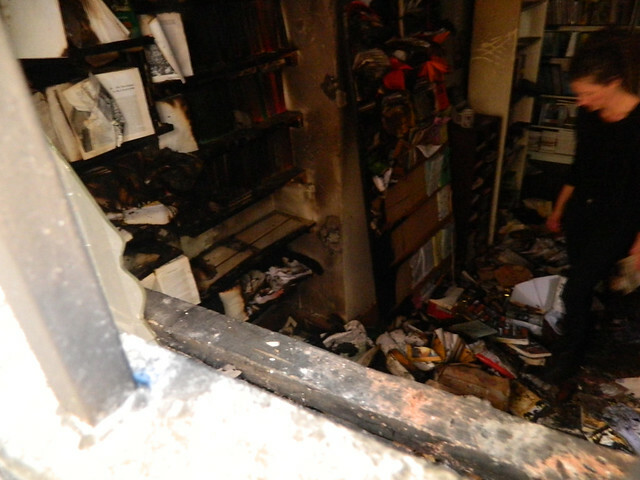 In the early hours of Friday morning, Freedom Bookshop was firebombed. Luckily no one was hurt and the fire was contained. This is not the first time Freedom has come under attack. As Britain’s oldest anarchist bookshop (founded in 1866), Freedom has been somewhat on the frontline of anti-anarchist aggression from the start. This latest attack has many similarities with a firebomb attack carried out some twenty years ago by the neo-nazi group Combat 18. Much stock has been damaged, as have the electrics. Freedom, like all radical bookshops, is run on a shoe string, and volunteer effort. Freedom don’t have insurance so will be launching an official appeal imminently. In the meantime cheques made out to Freedom Press are welcomed, and can be sent to the shop address. Follow on Twitter and on website for details. http://www.freedompress.org.uk Freedom are also asking for donations of anarchist books to help replenish their stocks. Down a small alleyway off Whitechapel High Street, a short walk from London´s financial district, sits Britain´s oldest radical bookshop. Founded by Peter Kropotkin and Charlotte Wilson in the 1880s, it has been a hub for the city´s counterculture ever since – a pick up point for campaign materials, a meeting space for activists and a printer of radical literature (including the OT) as well as selling books. But my visit is not on a normal day. In the small hours of the previous morning an attacker had forced open a shutter, broken a window, and set the inside alight. Next to the broken glass is a shelf full of volumes on George Orwell – perhaps Britain´s most quoted opponent of book-burning [http://en.wikipedia.org/wiki/Memory_hole] . The fire and water leaves his image distorted and charred. The books are reduced to an inseparable block of pulp. A throng of volunteers have gathered for the clear-up. Some are anarchists, others are showing solidarity with a group that has for so long shown solidarity with others. The atmosphere is somehow both cheerful and defiant. There is a human chain carrying salvageable books up the stairs. As there seems to be quite a queue forming, I join the other group, tasked with the soul crushing job of picking, cataloguing and disposing of the books that are damaged beyond repair. We organise ourselves into sorters and cataloguers, the latter of whom playfully get called the bureaucrats. “Hey bureaucrat – I´ve got five copies of Thinking Housing´ here, can you note that down?”. “Bureaucrat, are you listening? Five Anarchy in Actions”. Becoming aware of the managerial system we are inadvertently mimicking we decide to change tack and buddy up, instead rotating roles. No more bureaucrat-worker divide. As it turns out, it´s more efficient too. In a way it is a cheerfulness of necessity. The job of noting down books for the scrapheap is a sad one. The camaraderie is the only alternative to tears as we clock up three, four, five hundred volumes. The un-saveable ones are taken away in sacks. In their place comes cake and tea, then hot food. A bike powered sound-system pumps out funk tunes. Then a cheer across the building as the electrics flicker in to life. There´s a call out: ´does anyone need a job?´ followed by a wry chuckle and a movement of the yet-more people who have recently arrived, in to the back yard to start cleaning shelves. The pile finished I head upstairs. It is an altogether happier scene. Thousands of books are piled from floor to ceiling: Zapata of Mexico, Mutual Aid, a history of Anti-Fascist Action. Squeezed around the edge are tens of people, with standing room only, jay-cloths in hand, scrubbing, chatting, restoring and ruminating. Instead of the choking stench of ash that overwhelms the downstairs, the fresh odour of cleaning spray fills the air. One by one the books are lovingly relieved of their sooty second-covers and returned to their former glory. The items destroyed are just a fraction of those that remain. Three hours later and the shop is transformed. Everything has been removed, the fire blackened walls are being cleaned, and staff predict they will open again by Monday. 60 volunteers with no discernible leader have pulled off an awe-inspiring display of self organisation. If the attacker´s plan was to make important ideas disappear down the memory hole, it looks as if it has spectacularly backfired. As the clean-up operation shows, there is more than one way to encounter an idea. One is to read about it. But wholly more powerful is to experience it. And so it is today that written concepts are lived in reality and anarchy is demonstrated in action. Tim Gee is an author and activist based in London. His essay collection ‘You Can´t Evict an Idea’ will be published by Housmans later this month. Granary Square is a new ‘public’ space in King’s Cross. Sited infront of the new Central St Martins campus it is “one of the largest urban spaces of its type in Europe and will form a focal point for the whole King’s Cross area.” You can read more about it and it’s history on the King’s Cross Central website. Although billed as a public space, The Guardian has reported that Granary Square is actually a private space, and there are strict rules as to what activities can and cannot take place within it. Granary Square is not alone in this respect; there is a widening trend of privately owned ‘public’ spaces, and a growing case history of conflicts of interest and privatised policing within such spaces, brilliantly exposed and discussed in Anna Minton’s ‘Ground Control’. “Greeetz in Kings Cross Central, peeps. Aidan AD here, aka Voice of Kings Cross. But don’t worry, peeps, the psychogeography of Kings Cross is so simple. High places and fire-hills surround this ancient zone of London. I’m talking about Primrose Hill and Barrow Hill beside it, Parliament Hill to the north, St Michael’s Mount of Highgate in the north-east, and under the sunrise Merlin’s Penton of Pentonville. These were significant beacons of power in the faith of pre-Christian times. And guess what? A long time ago The Old River of Wells flowed through Kings Cross, aka the Fleet. Healing waters once upon a time; the sacred river of England. But of course she’s still there, 20-foot under street-level. Ladies and G’s, the good gets better and that’s a fact. Because the oldest church in the western hemisphere, I’ll repeat that, the oldest church in the western hemisphere, the ‘Head and Mother of all Christian Churches’ still stands where she has always stood in Kings Cross, beside the holy river. Course I’m talking about: Pancras Old Church. Then out of the blue comes Arthur Rimbaud, poet, psychogeographer, teenage prophet, the guy who put modern poetry on the map, the dude who invented literary surrealism at the age of nineteen then washed his hands of ambition. Like Blake, Rimbaud knew Kings Cross because he spent his great year of wonders here (in 1873) writing his Season in Hell and Illuminations. Arthur Rimbaud called this place ‘the miraculous valley of art’. And that’s exactly my point, Ladies and G’s. The arrival of the University of the Arts in Granary Square means that predictions about Kings Cross Central are coming true. Predictions which promise that one day we will see a small image of a new world, a city of the arts here at the heart of future London. In my wildest dreams I call this zone The Brill, Intelligent Playground, Vale Royal. So, to conclude with a more personal narrative. A month ago in Pancras church I married an angel on this earth. And two weeks after marrying my dream-woman Lucie I heard that my little verse about the angels of Kings Cross had been installed in Granary Square just over there… Go check it out, peeps, among those trees just over there! What a wedding present! But I nearly never made this gig tonight, Ladies and G’s, because long ago I barely survived two blocks away in the derelict houses of Somers Town. Could I have imagined way back then – down on the floor of the squats – that in 2012 I’d be standing here to give y’all a poem set in stone? cities behind your skies. Let me see! In the United States there’s increasing pressure being put on Amazon over a whole host of its business practices. Demonstrators protested outside a shareholder meeting in Seattle on 24th May, making demands which included Amazon stop dodging their taxes, and provide better working conditions for their staff. Greenpeace have also drawn attention to Amazon’s poor environmental record, which inspired activists to hang a large banner from Amazon’s corporate offices drawing attention to the fact. The Seattle Times has published a four-part expose exploring Amazon’s business practices, which gives new insight to Amazon’s disinterest in giving back to the community, squeezing of publishers, efforts to avoid tax, and poor working conditions. Meanwhile back in the UK, The Guardian reports that despite clocking up £7bn sales, Amazon has paid no UK corporation tax. At all. For more reasons not to shop with Amazon, please visit Housmans’ page on the subject here. We’ve written in the past why Amazon is bad news: it exploits its workers, it union-busts, rips-off publishers and authors (some of whom make no money at all from Amazon sales), and it is clear has every intention to monopolise the market (not just in books). To read all about that, click here. All of which is bad enough, but Amazon is hitting new lows with it’s latest ‘promotion’. It is encouraging shoppers with smart phones to go into bookshops and use a special Amazon app to scan a book, then walk out of the shop and buy it from their site – the reward for doing so is $5 for each book you don’t buy, up to a maximum of $15. On the one hand they are trying to turn bookshops into free showrooms for Amazon products, and on the other they are trying to drive real shops out of existence – all very reminiscent of the aggressive monopolisation policies of Wal-Mart. Here’s a source for the story. Help spread the word about Red Pepper! £6800 per annum (review pending), two days per week (some flexibility with days), based in our London office. Can you communicate with passion and energy about Red Pepper and recruit and coordinate a network of volunteers around the UK to promote and sell our magazine? Red Pepper is looking for an enthusiastic, organised and flexible person to join our team of staff and volunteers. You will be responsible for coordinating our presence at events and conferences around the UK, volunteer involvement and our office admin. Experience (voluntary or paid) of volunteer coordination and managing computer databases. That slogan, one of the many fantastically imaginative and piquant sayings created by the rioting French students and workers in May 1968, captures more than acres of print the political miracle spreading across the Middle East. It was a slogan that particularly appealed to Daniel Singer, the activist, journalist and author whose premature death in 2000 was marked by the setting up of an Essay Prize in his name. In 2010, I was lucky enough to win that prize, and Housmans has kindly agreed to put the essay I wrote – ‘Starting all over from Scratch? The Need for Radical Reforms in our Own Movement’ – on its website. I’ve asked for this not out of self-promotion – honest! – but because I’d like to see the ideas I’ve put forward get more discussion on the left. The question raised by the Daniel Singer Foundation was “Given the devastating effects of the present crisis on working people, what proposals for radical reform can be raised which are both practical to the vast majority while moving us towards the goal of socialism?” and essentially, my “answer” turned the question on its head. For many years I’ve felt that abstract demands play far too large a part in left activity. I’ve argued, using a quote from Singer’s last book in the title, that building a movement rather than a “party”, relating to where the working class is rather than where we would like it to be, is the way to go. I look forward to Housmanniks’ responses. As councils are forced to slash spending, our libraries are in the frontline of cuts, with many libraries set to be closed. Philip Pullman has made a passionate speech to defend public libraries which has become an internet phenomena in recent days. This map shows the public library closures in the UK. Click on View Larger Map for the interactive version.